Are you happy with your dentures? 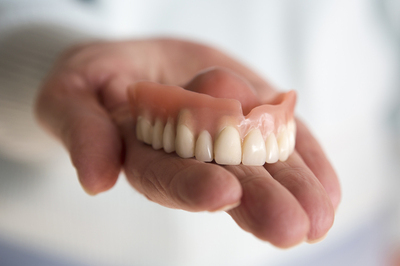 Dentures are a time-tested way to replace missing teeth. On the other hand, they certainly have their drawbacks. If you’re displeased with your dentures, or there are things about them that you’d like to change, you may want to consider all on four dental implants. All on four implants are a full arch of teeth that are held in place with as few as four posts. They’re a good choice for patients who need a total tooth replacement and patients with bone loss. Here are some reasons why denture wearers should consider all on four dental implants. You probably noticed a major change in your diet and eating habits after getting dentures. Dentures make it challenging to chew your food thoroughly, and some hard or chewy foods are probably off the table entirely, because your dentures just can’t handle them. Dentures don’t allow you to bite with the full force of your natural teeth because unlike your teeth, they aren’t rooted in your jaw bone. However, dental implants have a titanium post that takes the place of the tooth root. Because all on four implants are anchored to your jaw, you can bite with considerably more force than you can with dentures. This will help you expand your diet to include all of your favorite foods again. With all on four dental implants, you can feel proud of your renewed smile. Have you ever felt your dentures slide or shift positions in your mouth while you were smiling, talking to someone, or eating with a friend? Tooth loss isn’t something to be embarrassed about, but it’s hard not to feel embarrassment when your teeth are visibly moving around in your mouth. Again, the titanium posts that hold your dental implants in place will save the day. Smile with confidence, talk without covering your mouth, eat what you like without stopping to adjust your teeth. Your all on four dental implants will stay in place and free you from worry about whether your teeth are moving. How often you will need to replace or repair your dentures varies by patient, but it’s a sure bet that you will have to repair or replace them eventually. It’s easy to drop your slippery dentures while cleaning them, and they can shatter in your sink or on your tiled bathroom floor. Even if you manage to avoid this kind of damage, the dentures will wear with time and need to be relined or replaced. And what’s more, without the stimulation that your jaw bone used to get from your tooth roots, your face will change shape, which will result in dentures that no longer fit properly and need to be adjusted. All on four dental implants don’t need to be taken out and cleaned—you clean them just as you would natural teeth, which cuts down on the possibility of damage. And with good care, they should last the rest of your life. They also provide the missing stimulation to your jaw bone, which helps you preserve your bone mass and prevents your face from changing shape. Often, patients who already have dentures believe that they aren’t candidates for dental implants, but all on four dental implants are appropriate for many patients with dentures. To find out whether or not you’re a candidate for all on four dental implants, schedule a consultation.